The following is part three in a three-part series on sustainability by Falcon Boxpert and architectural interior designer Sarah Ellis. So far, we've covered four big reasons that shipping containers are excellent sustainable building materials: their ability to be upcycled, their modularity, their compactness and their structural integrity. In this final installment in our blog series on sustainability, we will address two additional "green" aspects of shipping container architecture that help prove their viability as part of a sustainably-designed future. 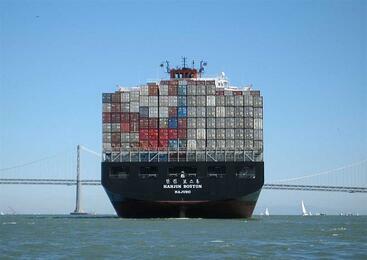 5) Ease of shipping container mobility. Because their standardized dimensions allow for easy transport on our existing ship, truck and rail infrastructures, container buildings can easily be moved from one location to another when necessary. This also allows for the prefabrication of entire buildings that can be quickly assembled (and later disassembled) on-site, which is always a greener alternative to on-site construction; building everything in one place that already has the means and resources available to do so (such as Falcon's workshop) greatly reduces the carbon footprint associated with bringing in the necessary people and materials to each new job site. "Prefab" architecture techniques have long been perceived by most designers as necessary methods of reducing environmental impact, but often there is still a vast portion of the work that must be done on-site; in most cases, shipping container buildings can be constructed almost entirely before they reach their destination, leaving only assembly and systems integration (plumbing, electrical, etc.) to be done upon arrival! 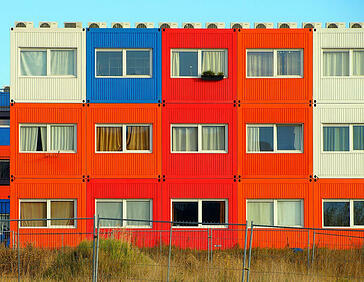 6) Relatively low cost of shipping container-based structures. A major factor in the ability of building systems to continue is their accessibility to the general population. While we are inundated every day with the latest and greatest achievements in "green" technology, the reality is that unless something is affordable enough to become widespread, its contribution to environmentalism is negligable. Shipping containers are a low-tech solution that cost as much as or less than normal building types, and the amount of money put into customizing and improving them is completely up to the owner. They are feasible options for much-needed low-income housing and flashy high-end design pieces alike. In this new age of environmental consciousness, Falcon Structures has stepped up to supply the public with sustainable shipping container buildings of all kinds. If you are interested in taking a tour of our facilities or if you have any questions for us, please don't hesitate to give us a call at 877-704-0177 or email us at info@falconstructures.com.